When all of the non-Madison plaster was removed from the masonry walls of the Large Bedroom, a large patch of whitewashed brick was found surrounding the existing ca. 1812 chimneypiece. 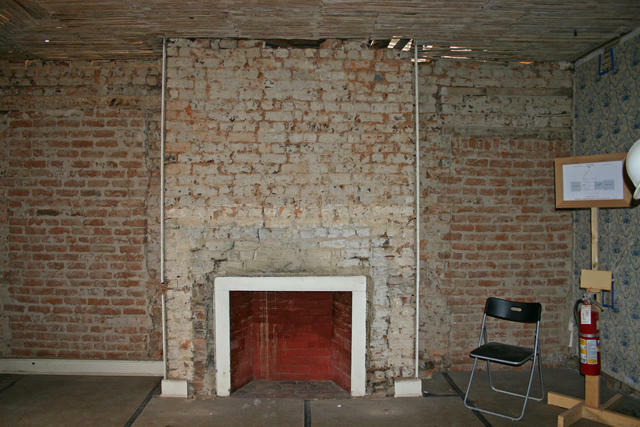 Because finding whitewashed brick is very often a sign that the bricks were left exposed after a room had been furnished, the Restoration Team believed that at some point the room did not have a chimneypiece. To partially disguise the space left by the absent chimneypiece, the bricks had been whitewashed in an attempt to hide the fact that the room’s major decorative element was missing. The Large Bedroom after the non-Madison-era plaster was removed.